DINU M. & CIOACÂ A. The Curvature Carpathians and SubCarpathians are a high seismic risk area (Vrancea Seismogenic Region) underlain by a complicated flysch structure developed on brittle formations. Torrential precipitations raging here are connected with dorsal cyclones, as a consequence, very active and dangereous geomorphological processes occur. A map of geomorphological risk was elaborated for this region, through the analysis of ten test areas. Nine geomorphological risk types \vere distingished and they were grouped into three main risk classes for slope dynamics, depending on basic rock and surface deposits. 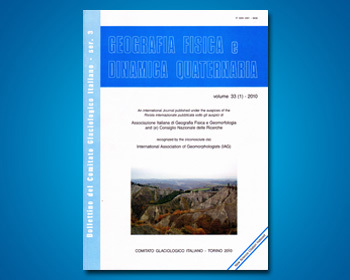 A detailed description is made of one of the study cases, the Poiana Brasov area; it is shown how the categories of geomorphological risk were outlined in terms of mass movement, dynamics on slope, frequency and intensity of present-day geomorphological processes and level of anthro-pic activity. The method employed proved to be quite efficient and the necessity to multiply such studies is outlined.